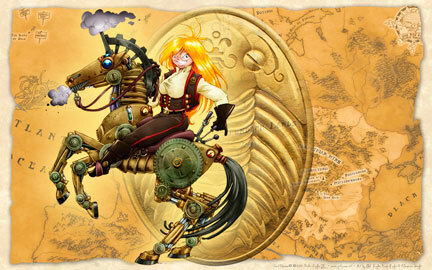 Congratulations again to Studio Foglio for winning this year’s “Best Graphic Story” for Girl Genius. io9 sums up the Hugo Awards for you. Been a good week. I’ve been reading “Swann’s Way” by Proust, which my brother gave me… maybe… 6 years ago? Slow and sleep-inducing, but with such adoringly lovely imagery, I think it’s colored my whole week (luckily I’d written this weeks scripts ahead of time). Summer finally arrived, I bought a muffin tin, had sorbet with Matt, and my girlfriend and I began harvesting the summer’s lettuce. yum! I shipped the Purfin M-32 shirts, so expect those soon. Oh, and I bought a ticket for my east coast travels, so, if you’re in Bethesda, Boston, or NYC — I’ll be attending comic conventions in your city in September (and San Francisco the first weekend of October). Look in the column on your right for more info! Question, though … I forgot when Pierrot got that nasty scar on his eye. 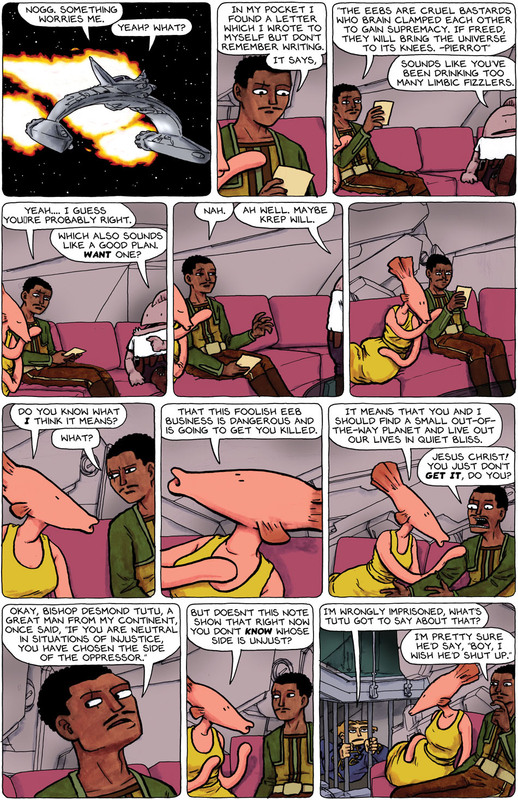 I figure I could look back through the myriad of strips, but might somebody refresh me, out of curiosity? When I think about all the different projects I’ve followed you through, Chris, I am awed by not only your skill but your versatility. From angsty dark satire to light whimsy to intricate comic space opera with several stops between, thank you for the journeys you take me on. Holy cats! So that scar is (in a way) a permanent symbol of Pierrot’s selfless dedication to Emily? You know who Bishop Desmond Tutu is? He is a hero & a role model for me. Zakalwe, google him, he’s worth reading about. He was instrumental in fighting apartheid & in helping South Africa make the transition to a true democracy. It is difficult to measure how valuable his contribution is – due to him, a lot of bloodshed didn’t happen – how do you measure the number of people who didn’t die? Zakalwe, forgot to add, I think Tutu would be the first to agree that his name sounds funny – he’s awesome like that. Yeah, Bishop Desmond Tutu’s petty great. and… p.s. I know I used the wrong form of “who’s” in panel 11 (Matt told me), will fix in the morning. Pierrot is South African? Since when? I am South African, and have met Desmond Tutu twice – I’m pretty sure he’d tell Dustin “uncukubili njeng empisi” (which is Zulu, even though Desmond Tutu is Xhosa, but the point remains). Oh, that means that you are two-faced (two coloured) like a Hyena. I was thrown by the same thing, Ric, but he’s in space among aliens, so I think he’s just referring to Dustinia as a whole as his homeland. “Pierrot writes himself” — does that have the double meaning I think it does? Ric, in my head he was using “homeland” to refer to Africa (he is from Gabon). “A great man from my continent” sounded too unnatural, And “homeland” is a broad enough term that i felt it passable, especially since, as @Ascension pointed out, when light years away from your planet and talking to aliens, you might pain home with broader strokes. But…. since it confused two of you (and likely others), perhaps using “continent” would be a better choice. Hmmm. @Tim…. um. I don’t think so. I’m trying to think what the double meaning would be. Maybe that at heart I am Pierrot (which would be only somewhat true)? I’m not sure what you’re thinking. I need tea. It is awfully early for all this thinking. My homeland is Terra Firma. So we are all Terrans under the skin and in our DNA that leads us back to Mother Africa, the cradle of Humanity. So the problem is even more convoluted and gives poor Pierrot a further headache. Yeah, I probably would have just gone with “my homeworld” or “my planet,” but then again, Pierrot and company are still relatively new to the whole galactic civilization thing. Also, my inner editor needs to say: “whose”. Not sure why this suddenly impressed me, but your interiors and view-angles are great. I just wish some backboneless floozy would develop opposable thumbs. I just cant get uniformly sized arm tentacles without internal skeletons that end at a point that has no point. I look at it and my inner evolutionist nazi just gets upset. Same way that I keep telling my dog that she just needs to evolve opposable thumbs and she could get her own food, but she just keeps looking at me adoringly and refuses to evolve to a higher canine. The cans remain for her unopened. Fiyena – my least favourite floozie today. Sorry – I did not feel like ranting entirely on topic today. Got my Purfin t-shirt today! Looks even better in person than on the web. I wore it out and people asked me about it, so I told them about the comic and website. Hmmm…Maybe, Chris, you would put the website address across the back or something so that when they ask, I can simply pivot and say; “Look here and you’ll see what it’s all about”.